With discount Halloween costumes, the fun of dressing up and becoming someone else for a night doesn't have to break your budget. 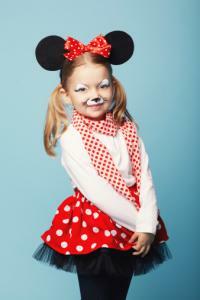 Discount stores like Costumes4less.Com are the best place to find costumes and costume accessories on a budget. Watch the sale ads in October to take advantage of the cheapest prices. Most stores will devote an entire aisle to costumes, if not more. However, even the best retail selection is still not as good as you might find at a specialized Halloween store. If the costume you want isn't carried by discount retailers, and you have to visit a Halloween-specific store, consider buying any make-up and accessories at the cheaper retail outlet. In addition to providing discount Halloween costumes, Costumes4Less.com even offers a price guarantee. If you find a lower price anywhere else, they'll give you a 10 percent discount. Spirit Halloween lets you sign up for email alerts, so you know when something goes on sale. Be aware of shipping costs. There's no point in saving $5 on the price of a costume, only to pay $6 for shipping. If you see an item you like on clearance, act quickly because supplies are limited. Halloween costumes are also available on eBay. You can search for costumes in general or hunt for a specific type. Check your local stores the day after Halloween to take advantage of discount Halloween costumes at 50 percent or more off the original price. The only disadvantage to this method is you have to commit to next year's costume today. This can be a problem if you're not sure how much your child will grow in 12 months or if your kid always asks to dress as a popular character from the latest movie or television show. Even if you can't find an entire costume, it's a great time to stock up on multi-purpose accessories that you can use for a variety of looks. A sparkling tiara can be equally useful for a Princess Costume or a beauty queen. With a little imagination, you can use wigs and make-up to become everything from a witch to a rock star. One of the best ways to save money on Halloween costumes is to make them yourself. You can look online for cheap Halloween costume ideas or use your own creativity. You don't even have to know how to sew. You can make many costumes with basic cutting, pasting, and painting skills. Check yard sales during the summer for full costumes and pieces you can build into costumes. Thrift stores are also a good source for costume basics. If you plan ahead, you can also check online auction sites such as eBay for low-cost costume options. For the ultimate in discount Halloween costumes, organize a costume exchange with friends, family members, neighbors, or co-workers. You'll find a new use for your old costumes while saving money. If your costume choice is more involved, such as a Medieval Costume, consider renting to save money. You'll get the detail and quality you need without spending too much money on an outfit that will only be worn once. If you really want a discounted Halloween costume, you can find one. You just have to be flexible and willing to choose from what's available to you. Check out all the resources both online and local, and you're sure to find a costume you like that won't empty your wallet.